How will this improve my swing? By training on the Golf Fit Swing Master™ you will actually improve your golf swing while you develop a stronger, more flexible swing motion. With input from top ranked teaching professionals the design and function of this equipment guides your body through a picture perfect golf swing in slow motion and against an easily adjustable resistance force. While performing this slow motion swing it is easy to focus on the timing and details of a quality golf swing. 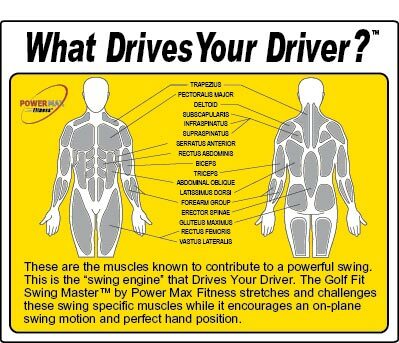 As you maintain good arm extension on the backswing motion, the Swing Machine guides your shoulder turn on the correct swing plane into a well balance and fully loaded back-swing position. Then, as you make your weight shift on the platform and initiate your downswing you are approaching the ball striking zone on an inside path and using the correct hand and arm position which will trigger a delayed or low release and generate power and speed with maximum efficiency. By performing this rotational motion over and over your body will develop the muscle memory needed to make this correct swing a habit.